THOUGHTS, STATS & STORIES ABOUT THE STATE OF SOCIAL MEDIA. A book by Esteban Contreras. The web has gone from being a network of hyperlinked pages to a network of individuals. There are now over billions of people sharing their lives on Facebook; and that's only one of many social networks enabling and dictating how we connect, how we learn, and how we act. Instagram, Twitter, LinkedIn, Pinterest, and a long tail of social media services have transformed how we interact with the world around us. Everything we know is being re-imagined for a new era of real-time human communication. SOCIAL STATE is a visual, in-depth exploration about the integration of life and technology; covering topics ranging from the implications of openness, virality, influence, and privacy -- to the unique opportunities presented by the emergence of social marketing, social customer care, and social good. SOCIAL STATE is an insightful and entertaining read written from a unique perspective. Born in Guatemala City, Guatemala, Esteban has spent his career focused on the convergence of technology and marketing. Esteban Contreras paints a picture of what the world is going to look like as social technologies become part of everything around us. Whether you are an enthusiast or a skeptic about all things "social," this book is a one-stop shop packed with stats, practical implications, and real-life examples. 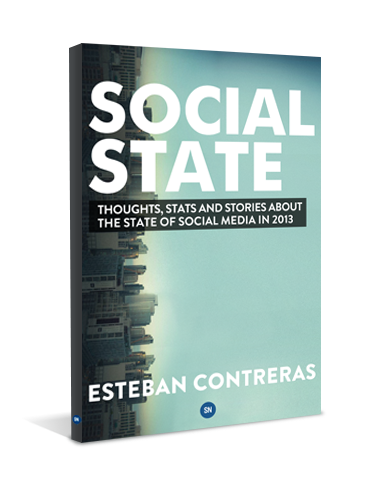 You really need to read #socialstate, the new book from @socialnerdia. Great insight and data on the state of social platforms.